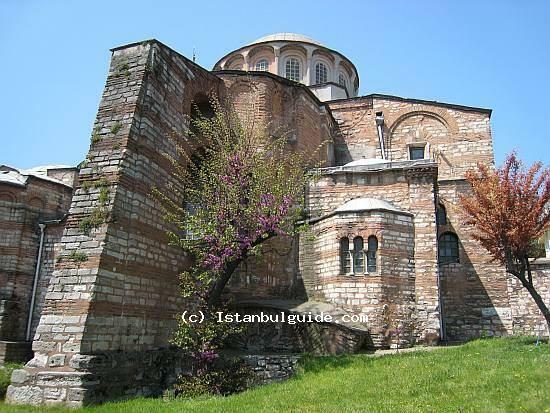 Chora church is situated in the western, Edirnekapı district of Istanbul. It is open to visit between 9am and 6:30pm except Wednesday. But it has shorter opening hours during winter months. Chora Museum feature on many tourist itineraries. During your visit it is allowed to use camera without flash. Chora means the countryside or outside the city. When it was built as a first at 5th century it was indeed outside the city walls but there are no remains left from the original church and the first form of the present structure. At that time its original name was St. Saviour in Chora and it was a small monastery just outside of the city. Later on, it was destroyed by couple of earthquakes and abandoned for many centuries until the area was inhabited. Today's church was constructed after two centuries by Maria Doukaina, mother-in-law of Alexius Comnenos I in 11th century. In the 16th century after the Conquest of Constantinople, the church was converted into a mosque (Kariye Mosque) by the Ottoman rulers and the mosaics were covered with plaster and a minaret was built outside but later minaret was collapsed on the dome because of an earthquake, thus the dome was rebuilt but some mosaics were lost. As a last, it became a secularized museum in 1948 which has a wonderful showcase for the mosaics and frescoes of 14th century Byzantium. The most beautiful mosaics and frescoes that you can see are displayed in Chora Museum in Turkey because it has one of the best examples of Byzantine mosaic art. The architecture of the Chora is similarly artfully distorted, chaotic, asymmetrical, and decorative. It is not as large as some of the other Byzantine churches but it has more beauty of its interior. It is a 6 domed church.